Testimonials from our customers. If you wish to submit comments about your experiences with us you can do so here. We Again Had The Opportunity Of Going With Bruce On Again,and game to go on the dunes once more.This Time We drove south for Ten Kilometers To “Tin Town”,then a return trip driving north and dove into the Stockton Bight Sand Dunes With Challenging & Exhilarating Dune Driving.Bruce also showed us “Quicksand” and how great care is needed to avoid these hazards while beach driving.Again a great afternoon of Adventure with Bruce As Guide & Teacher. 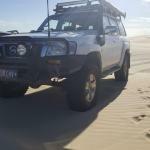 bushland, exploring a beach and the sand dunes 4WD tour. You are a delight and very entertaining with your knowledge of the area, experience with the 4WD, your witty sense of humour and your delivery of your funny jokes. 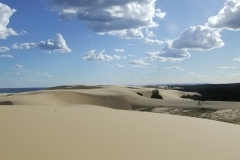 sand dunes and exploring the beauty of the bushland at Anna Bay. Alan & I will definitely re-visit your 4WD Tag Along & Passenger Tour upon our return to Nelson Bay. Keep up the fantastic work!!! You are a credit to your industry!!!! Had a great afternoon with Bruce leading us around the area. As a seasoned 4 wheel driver I wasn’t sure what to expect but Bruce was great and would recommend anyone of any experience level tag along for a tour. He was great with the beginners in our group and even provided us with some great tips to improve our sand driving. The man knows his stuff and has a wealth of knowledge on the area. It was mine and my family’s first experience in driving on sand and dunes. I learnt a lot especially about wildlife and 4 wheel driving on sand. To top it all off is THE BEST tour guide around. Bruce made the tour very entertaining and fun for all of us and that was a big plus. I would never had the confidence to drive on the dunes without his guidance. We are now planning on joining another tour towards the end of the year. We cant wait!!! The 4WD education experience was excellent, we learned lots about the vehicle and how to manage it in bush/sand terrain. Bruce was informative regarding the Tomaree NP, the wildlife, the environment and what not to do when driving a 4WD in these situations. He had some great stories to tell and jokes galore. Can’t write to much, it will spoil the fun for everyone. GO do it now. We all had a great time. From the 4 year old to the 48 year old. A very enjoyable day from the bush track to the sand boarding. Thanks Guys. Bruce is amazing! His knowledge is impressive and his easy going style is lovely. Nothing is too much trouble. We had a fantastic time with our Tag a-long tour, following Bruce’s clear and concise instructions. Although we have been off road before, and consider ourselves well informed, we learnt some valuable information. Will definitely return again. A great tour with a very experienced guide. (Bruce). Being new to 4wds, it was a fabulous introduction for us to off road driving, combined with fantastic scenery. Highly recommend this tour, even if you are experienced off roaders. Bruce knew what he was doing, also very knowledgable about his environment. Very witty too! So nice to have a beaut bloke like Bruce to show us the basics of 4wd driving in his backyard. His easy going manner and wit made for a really enjoyable experience. Thanks Bruce, looking forward to doing the Blue Mountains tag along. we than ventured into the back Dunes and when we saw the size of some of the places he was taking us was to be seen to be belived. heeven entertained the kiids that was with the other parties and they had a great time on the sand boards I thought about it and could have done it but thought hmmm maybe not. What can I say about these guys? They go above and beyond to make this experience such an amazing one. We had the best fun ever travelling the sand dunes and sand surfing. Bruce and Nicole are such beautiful people other such a great sense of humour. They had us laughing the whole time. My boys had smiles from ear to ear. Thank you so much for providing us with a truly memorable day out. Would like to say, that we had a great time as a family on this tag-long tour. But especially appreciated the time taken to explain to our 17 year old who was driving, the basics of 4 wd knowledge and some hard and fast rules to driving in Sand dunes. It was the best experience for him and one that he will use for the rest of his life. I would fully recommend doing this 4wd tag-along to anyone new to 4wd. Also a great one for families to do. I felt very safe in the hands of our tour guide. Believe me going down a steep dune for the first time ever, you need his advice! Very friendly, very informative and a lot of fun. Five stars! We booked a guided tour with Bruce not knowing what to expect. It was a totally unique and exhilarating experience. Bruce’s driving skills were outstanding and we would certainly have faith in him to take us on another tour of the sand hills. It is incredible how well he handled the vehicle on slopes that would seem impossible to negotiate. Thanks Bruce for a great day and experience. As a school excursion to Port Stephens we have been using Bruce and Nicole to take our students on a tour of the dunes and sand boarding on Stockton beach. Every year Bruce and Nicole entertain our students with jokes and facts about the area. It is a high light of our annual year 9 excursion and highly recommend everyone to go out with Bruce and Nicole as there experience is phenomenal. Thanks for the many years past and to come! An awesome experience with Bruce’s Tagalong Tours. Bruce offered expert advice on gearing for climbs and descents and made the whole trip even more entertaining with his jokes and good humor. Would recommend the dunes run as even with my level of experience, I was still surprised to find that there is so much more to driving a 4WD vehicle than one could expect . Thanks again Bruce. You are a legend! About me:Proud owner of a 2010 2.5 Turbo Diesel Nissan Navara - TJM suspension mods and Maxis tyres equipped to handle the bush, sand and mud . Recent trips include crossing the Simpson Desert along the French Line in August 2015 together with numerous runs from Beachport to Robe. Found Jakem's Farm to be quite challenging and definately would invest in a water separator thanks to Bruce's tip. Thanks for another great day out on your bush, beach and dune tour. It was so good we had to go again and bring our mates who had never gone off road on their Discovery 4’s. 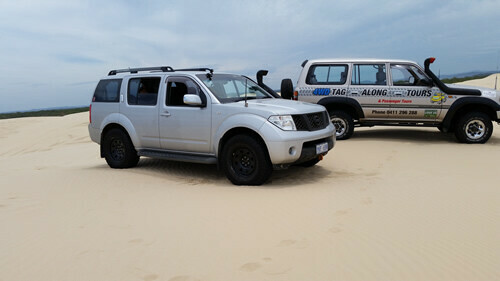 We all had a great day out on the sand testing out our 4wd’s capabilities. Thanks for the tips in negotiating through the dunes and for an enjoyable afternoon. If you want to have fun in Port Stephens, join Bruce’s tour! I can’t overstate how much fun my family and I had in our own car on this tour. As a novice driver with no experience on sand, I was expecting to get stuck all the time but the training that Bruce provided as we went along kept me going through everything including challenges I never would have dreamt of trying on my own. We unfortunately missed this year’s Blue Mountains tour but will hopefully hit the next one; I doubt we’ll ever stay at Port Stephens without a repeat of this tour. My wife & I went on this 4wd tour after doing the Port Stephens tour earlier this year. We wanted to relax for the weekend and we did that and more. Bruce & Nicole were very friendly & accommodating from when we arrived Friday til Sunday afternoon. There were a lot of interesting people we met and we learned more about our car & how to drive it, in the training grounds then on to some great tracks around the Lithgow area. Thoroughly enjoyed ourselves. The Lost City was beautiful. Thanks once again Bruce & Nicole for a wonderful time. Well worth it. Thanks heaps for a great day on Sunday. We learnt a lot and had a great laugh. WE would recommend it to anyone that has a 4wd. What a great way to spend an afternoon!! The rain only added to the experience and certainly did not dampen the mood or Bruce’s great sense of humour. Bruce’s ability to be funny, knowledgeable and informative was one of the many highlights of the tour. The ability to experience the back dunes of Stockton that are now generally off limits was a fantastic opportunity. As a keen photographer they made an amazing subject. About me:Having done some 4WD'ing, Bruce once again proved that you can alway lean more. His knowledge, experience and willingness to share this was most appreciated. 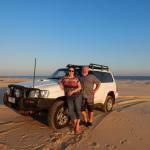 Hello – my wife Dijana, son Oliver and I did a tour with you on Stockton beach and Samurai a few months back. 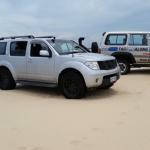 Wanted to thank you for the skills we learned – we just did Fraser Island, up past Indian Head, over to the west side and all around without getting bogged or damaging the vehicle – due to the lessons we learned on the half day with you guys. we went on a4wd tour with Bruce, we had the best time, would and have recommended it to every one we have spoken to , Bruce is a funny character from the start to the finish , enjoyed by all of us(3 years old to 40 years old) we are still talking about it. Had fun towing other people out, especially the brother-in-law, he is still not happy. Just want to drop you a note to say thank you so much for a fabulous few hours on Thursday. 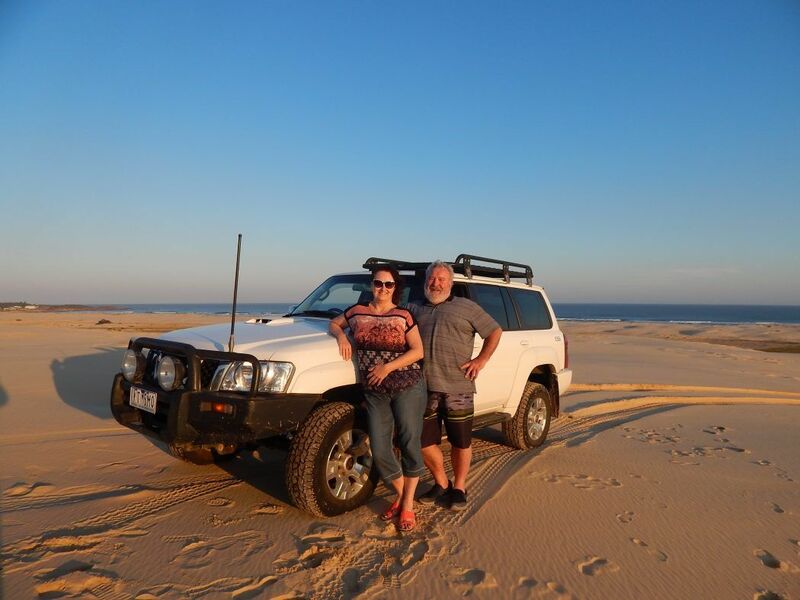 The driving through bush, on beach and down dunes was so much fun but the added bonus was the knowledge of Bruce about the surrounding countryside, beach headlands and wildlife in the area. He made the tour so much fun and so much more than just being in a car. The sand boarding at the end was magnificent, albeit slightly scary, and my calves certainly appreciated the work out! We all had fun, from our 3 year old son to our 22 year old god-daughter, truly something for everyone. I will be highly recommending you for anyone looking for a great experience and I am sure at some point we will be booking ourselves back on the tour. HI Bruce we had a great time, learnt a lot and have recommended your tours to several other couples. Hamish enjoyed running in the dunes.. Thanks again for the skills you gave us and confidence to try them..
We did this tour on our last day of our visit to this region. We discovered so many places that we wished we could have spent more time at. It was a morning well spent. Just the right amount of time to see and do lots of great things but not too long. Important when you are travelling with children! Our youngest was 8 months old at the time too! Do this tour, it will be well worth your time time and money! Thanks! My wife Dijana and little Chocolate Face would love to say thank you. We had a terrific time. I was able to put some of the confidence and knowledge you instilled in me into practice the next day, making the trip up just before low tide from the Gan Gan Anna Bay entrance to see Tin City, then up to the Sygna. After that we went well behind the front dunes and cruised back to the Lavis Lane entrance up some big hills.The nicest thing was that I could finally relax, knowing the vehicle was capable of making it over a variety of terrains. My wife is still hitting me for making her go down the big dunes with you – excellent! Will certainly recommend to my friends. I would like to thank you for the great tour your company provided. As a novice 4wd owner and never driven on sand your tour was great. I know for sure I would have been stuck somewhere along Stockton beach without your help. We had a fabulous afternoon with Bruce on his tour. This was a fathers day my husband will not forget. Bruce was amazing with local knowledge and help/advice on driving. He really challenged us to do things in our vehicle we wouldn’t have dreamt of doing on our own. Perfect way to spend an afternoon in a fantastic location. Thanks so much! Hey Bruce, just wanted to let you know what a good time on your blue mountains tour, all the guys made us feel like family and went above and beyond what we expected, we will definitely be back for more. Thanks for an absolutely awesome day yesterday doing your Tag along Tour of the Bush, Beach and Dunes…. Definitely an experience to remember and the wife and kids are still buzzing about how great it was. A BIG THANKS for taking the time to explain the various techniques of driving off road and making a dreary day one of the most exciting times we’ve had in a vehicle ever. To anyone considering doing the tours with Bruce, don’t hesitate as I am sure it will be a memorable experience just as ours was. All the best and we hope to see you again in one of your other tours. This is a quick email for two reasons: one is to thank you for the tour we joined (tagged along to) on Sunday 19 May in Anna Bay. Our overseas visitor, a young lady, enjoyed the tour immensely and had a lot of belly laughs at your stories and jokes. We explained to her that she was hearing typical Aussie humour at its best, and a world view which is second to none in this world. It was a very enjoyable and very funny experience, for which many thanks. I’d do it again! Second is that you mentioned you’re planning a Blue Mountains 4WD tour in the near future.. we would be very interested, along with several other people as well (two families at least with two 4WD). It’s been very wonderful experience, Bruce has been excellent and very friendly with all his experience, I’ll bet that’s who everybody would like to tour with. Looking forward to tag along again. Cheers. Everyone in our car loved it. Thank you Bruce for making this tour so enjoyable. Everyone in our car loved it. This tour was given as a present to my son-in-law, Pete Cribbin, who thinks it was the best present he had ever had! He was happy as he saw lots of new country as well as tackled the sand dunes. He reckons he would not have attempted the dunes without your experience. My grandson just loved sliding down the dunes – Pete ended up having to take him down 4 times and still he wanted more, even after the steep climb up and the sand in his eyes. I have lived in the area all my life and you showed me areas that I did not know existed. Who needs to travel overseas, we have it all here. You tag-along tours are great value for money, see the area AND get some training as well! Please let us know when you have any new tours available. This was our first foray into proper 4 wheel driving. Picked up some great tips and had a fabulous time at same time. Really enjoyed driving up and down the dunes, felt the price was worth it also once we realised the dunes are closed to public driving (they can only drive on the beach) and we experienced a spectacular sun set whilst doing a bit of sandboarding down the dunes. Please keep us posted of other 4wd trips set up in future. Just wanted to thank your for the really fun time we all had on our tag-along tour! We didn’t know our little X-Trail was so capable and it was great to see what it could do in a safe environment. We all really enjoyed the stopovers as it was a great way to stretch our legs and we got some really amazing pictures, especially on the dunes when the sun was setting! Overall we thoroughly enjoyed you comedic commentary and look forward to exploring some of the other tours you have on next time we’re there! I loved the experience with Bruce, he was a great teacher, guide, took extra effort to guide us through the steps of off roading through sand. He is also a keen observer, and a good lover of nature. We have driven on sand before, but wanted someone with experience to help us test out the new Outlander 4×4. Our friends with their Kluger hadn’t driven off road at all before our day out with Bruce. He started us all nice and easy, letting us calm down before hitting the next level, then throwing us off the cliff when we were good and ready! For a couple who have driven sand islands in Qld quite often, we have never been tempted to do what Bruce and Nicole told us to do – our adrenaline got a bit of a workout at the end. The kids were thrilled and we were left with the thought “that was GREAT value for money!”. Thanks Nicole and Bruce for a very special day out. About me:Experienced on sand with previous 4x4. Highly recommend! Bruce took us to the dunes, beaches and through the forest. He turned up punctually. He tailored the tour specifically to what our small group needs, which really made the trip enjoyable. There were 4 of us, our elderly parents, my husband and I. Personalised service, it was my third time to Port Stephens tours but the previous tours were with tour buses. The 4 wheel was comfortable. Very safe and professional driver who paid attention to the road which made the experience was even better. Bruce was friendly and his knowledge of local flora and fauna as well as the dunes was immense! Great for the traveller that want to see Port Stephens but do not want to sit on a tour bus of 30-40 people. Though it was the fourth time I been there, I never realised that the views over the dunes were spectacular and gorgeous! This time I did not feel drowsy and uncomfortable at all but felt fresh. I could enjoy and appreciate the scenic beauty. And the coastal scenery was lovely! The only thing was it would be better if Bruce could also include going to Tomaree Head summit in the future. We expected to see the panoramic north coast views. We were a slightly disappointing as we thought it was a typical place where tourists would usually visit. A thoroughly enjoyable trip overall definitely recommend to friends and family. Thank you Bruce! We had a great time and experience with tag -along tours.Great family fun ,we would like to thank Bruce for all his advice and knowledge and great sense of humor, highly recommend. Thanks again for a great fun and informative day on the beach last Wednesday. Thanks also for your hospitality and the lunch afterwards, including the tour of the little critters. I have downloaded my camera images back at home and will go through this week. If I find a couple of extra shots, I will send them over to you. You are welcome to use what you like, if they are good enough/ appropriate. I am busy recommending you to friends already! Keep up the good work. I can not now wait for my return when I shall be back again on the dunes this time hopefully with out getting bogged and having to get Bruce’s help to dig me out which was great as I now know what to do if it happens again and I am not on a guided tour. It was a day out that will stay with me the dunes were fantastic, the driving up and down them was out of this world and Bruce was a fantastic teacher, guide to the local dunes and beaches and also when it came to doing things he always tested out the water first so to speak so the safety aspect was first class. We had a great time! A taste of the bush, close encounter with the Aussie Native flora, missed the ringtail possum, maybe next time huh. Then the hidden whale playground, a healing place I call it next to Big Rocky/ Small Rocky and there is more… to end the day with the 4WD learning experience. Couldn’t get any betta, thanks mate! be back for more. Below is the review I left on trip advisor hope you like it. If you only have time to do one activity while in Port Stephens make this a must do. The passenger tour is a sheer delight and the occasion was my birthday. A great time was had cruising up and down those massive sand dunes, sand boarding down them wow what fun and with Bruce as your our tour guide you will be totally informed about the area and at the same time have a good laugh. A Tag along vehicle got bogged but Bruce being a true professional got them out in the pelting rain. The tour went to tin city and it looked like a movie set with Bruce telling us the history and stories of the colorful characters that live there most entertaining. A tour like this is great value for money, not rushed and you will not be disappointed in any way. We would never have done that! About me:Experienced at offroad but definitely learnt more on this tour. This tour was a big think for us, from a very beginning to the last moments on a tour with a nice sunset on a Stockton beach. We came with our Mitsubishi Outlander without high expectation, possible beach driving if we are lucky, but Mr Bruce showed to us what our 4WD can do. Thank you Mr Bruce. Strongly recommended! 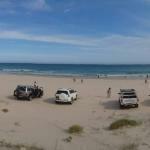 Thank you for an enjoyable run down Stockton Beach and the dunes to the Sygna wreck recently. Your training on our first outing with you held me in good stead to enjoy your attempts to get me to join the “lemmings suicide squad” over the edge of some of those dunes. I just wanted to let you know how great our trip out with you was last Sunday, the 10th July. You know I was a bit hesitant heading out there in my AWD Toyota Kluger but you put my mind at ease. Your instructions were so simple, clear and easy to follow and you soon had me doing things in the dunes (and in the Kluger) that I still can’t really believe. I just hope I can get the grip marks made by the better half out of the door handle on her side. Your personality and good humoured attitude made the trip a very memorable experience. My kids are still talking about what we did out there. I couldn’t recommend you and your tour highly enough and I would say to anyone wanting to drive their own vehicle on the dunes to do the tour with you first. Even if its only for the very important knowledge of the dunes gained from you like “quick sand” and sand recovery techniques. As for the Kluger, I can assure anyone with one that it handled everything thrown at it like the other 4wd vehicles that were with us. Especially when the driver followed Bruce’s instructions!!!!!!! Thanks for a fantastic experience and we will be back next year to do it with you again. Melissa, Jay, Jackson, Emilee, Georgia, Scott, Gemma, sam, Harry, Oliver, Pete, Kristy, Taylah, Brodie, Geoff, Jill, Lauren, Will and Jake! Just wanted to say how much we enjoyed your trip earlier today. Of course the scenery and experience was magnificent, but your personality carried the day and was a real hit with my Mum and friends. They really enjoyed your company… I actually live in Sydney whereas the girls reside down Bendigo way. I was only up there for the weekend whereas the girls were up for the week… Anyway, what I’m trying to say is I’ll definitely be back with my partner, Donna (who couldn’t make it), and we’ll definitely come on your trip sometime soon. Hope to see you again in coming months. Many thanks for today and good luck with your adventures. Thanks for a great afternoon! Safe, fun and informative. Hi Bruce,we had the absolute pleasure of going with you in your vehicle on the 27th August. Just letting you know it was a great day and really appreciate the effort you put in to please us. This was most certainly the highlight of our stay at Port stephens. Cheers. Just wanted to let you know how much fun we had on Mondays tour. What a great experience we all had and your commentary kept us laughing. Thanks for the great day. Thanks for a great time today! Thanks for a great time today! 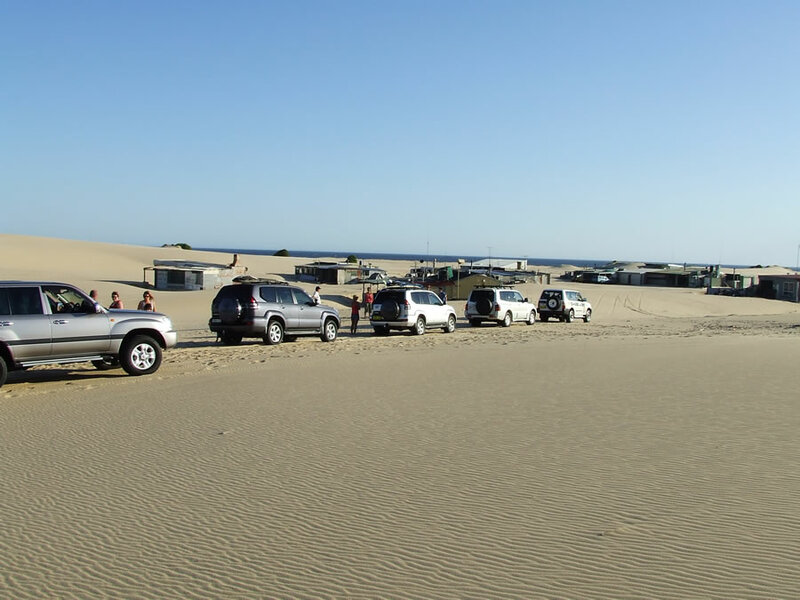 I was very nervous about doing this tag-a-long as this was our first time taking our 4WD into the sand dunes but you filled us with confidence and soon had us negotiating ascents and descents that we would never have attempted. The dune scenery and Tin City were amazing, just beautiful! Who would have thought I would be sand boarding at 57 years old. But most of all, your friendly relaxed attitude and knowledge of what you were doing, made us feel safe and confident enough to continue 4WDriving in the future. Bruce, just dropping you a line to say how much fun we had on your tag-along tour on the 19/10/10. We tagged along in my Zook, a little nervous and apprehensive but your instructions were second to none and my confidence in my abilities and the vehicle abilities grew by the minute. We had an absolute ball, the highlight of our stay in Port Stephens. The repeated adrenaline rushes as we conquered the dunes, the inspiring views we managed to see, the history we learnt and the confidence we built were all a part of what I can only describe as an AWESOME experience. I can only STRONGLY recommend that anyone wanting some adventure give you a call and join your tour. Thank you for the experience, I am eagerly planning another trip to Stockton and hope to see you on the dunes. We did the Tin City and sandboarding and had an absolute ball. Bruce was very thorough and i learnt a lot about how to tackle the sand dunes. Some of the dunes that we did, i would never have thought were possible, and Bruce’s advise was second to none. The 3 kids (3 year old, and twins aged 5) loved it plus the sand boarding. What great fun, however the climb back up after each run was hard work. Thanks again Bruce…. I went yesterday on a tour as a passenger with Bruce. Despite the fact that I am disabled and use a walking stick, I was able to appreciate fully the whole experience. Bruce made me laugh all the way through. We were expecting a 3 hours tour and in fact it finished after 4 hours and 15 minutes. We not only drived through the sand dunes, but also went to tin city and did some sand boarding. Even I, despite my disability managed to do it. (okay coming back up the sand dune was a nightmare, but I did it). Bruce was ever so patient and always made you feel that you could do things. I would definitively recommend it to anyone. If you want lots of thrill and laughter, book your toor ASAP. X-Trail with a yellow boat! Sounds weird, That is, we forgot to take the canoe of the roof, Had concerns with the T31 if it would be OK, Went fantastic, Met some really great people. (Bob and his family in the Sante Fe) Took the young bloke in his T30 X-Trail and with the guidance and coaching of Bruce we had a great time and learnt heaps, Took the cars on the beach again the next day, I am glad we purchased on of the recovery packs, My young fellow got just too adventurous and needed to be rescued by Dad, (Good for the ego) Thanks – Great history, Great views, Great training, Great venue. Well Done Guys!!! Whilst we have been to Stockton before, we have never experienced anything like this. We originally booked this tour so that we weren’t alone in testing out our new 4×4 – at least someone would be there to get us out of trouble! We also had the parents with us – who had never been offroad before so they were quite excited but nervous at the same time. At the end of the day we had a blast and mum and dad had a great time. We enjoyed Bruce’s comedy and education on Stockton’s part in WW2 and was very interested by Tin City – although we had driven by it several times, we had never stopped to see it and learn about it. I am more than thrilled that we booked this tour and would recommend to anyone – even the experienced drivers and frequent Stockton visitors! Thanks Bruce, it was the highlight of our short stay! who said the Santa Fe couldn’t make it! Thanks so much Bruce, we had a great adventure with you guys and learnt so much! We loved the day and got some great photos! We now have so much more experience and confidence in ourselves and vehicle. Thanks again and hope to catch up with you! My comment is that you did very well. I loved the boarding down the sand dunes. It’s very interesting that those sand dunes are the biggest sand dunes in the southern hemisphere. I’d love to be a teacher. Well it’s night time now. 9:19 PM on the 2/1/2010. We have been to this area for years and this time decided to take our very domesticated 4wd (School and shops is as tough as it’s seen til now) I was a little nervous driving off road and discovered ‘Tag along tours” where you drive your own 4wd/SUV and they lead you in their 4WD guiding you safely but with a few thrills, the whole way. If you are in the area and have a AWD or 4wd I can’t recommend these guys highly enough. We have a Nissan X-Trail which is no real all terrain vehicle but Bruce our guide took us to places we could never have dreamt of going to ourselves. To Bruce, Thanks for a great afternoon, we had a great time learning about the dunes and what our vehicle was capable of. The boys loved the sand boarding down the slopes. Very enjoyable, we recommend the tour to everybody, the boys talked about it all the way home. We definately will be doing it again next year. Thank you for a wonderful tour through the sand dunes and beach of Stockton beach. Our students enjoyed the knowledge and antics of our experienced drivers. We had a great sight see through the dunes and then onto the slopes for sand boarding. From here we went for a tour of Tin city and back along the beach. Thank you very much for the enjoyable trip. We are looking forward to next year. What a day to remember!!! I honestly didn’t think our X-trail could do what it did that day. I suppose the driver had something to do with it (he thinks). Bruce, you made us laugh and the whole day was something we will always remember and yes Bruce I still hate heights (ha,ha). We have told all our friends about you and if we are in the area again we hope to see you again for another fun day. I would highly recommend your tours. Thanks again. Thank you Bruce for a Fantastic Experience, we had a great day, Due to your patience, wise and funny words of wisdom Shane did things in his 4WD that he never thought he would ever attempt. The kids are still talking about their sandboarding adventures and we are still showing off our photos and video of the day. Thanks again and hopefully see you again next year. We had the best day guys. We learnt so much from you and haven’t laughed so much in ages. We will most definitely be back. Maybe Derrith will have a go and even open her eyes. See ya soon and Thanks. I’m a mad-keen driving fan. My wife, well, isn’t. To say she was a little nervous about the idea of exploring the Stockton Beach sand dunes in a borrowed 4WD was an understatement! However, our summer afternoon with Bruce was one of the best things we’ve ever done as a family. The terrain and the scenery is simply jaw-dropping, the skills required to keep you going in a very challenging environment were expertly relayed by our hosts, and the sense of achievement once you’ve conquered the dunes (and you will!) is incredible. And all you need is your 4WD, your common sense and a smile. Bruce took the time to make sure our kids (12, 6 and 2) were thoroughly entertained, too, and they teased my poor wife unmercifully the entire time! I’ve been lucky enough to do a lot of cool things with cars, but the tour of one Australia’s most awe-inspiring National Parks, with such a gracious host, has firmly planted itself right towards the top of my list. I absolutely recommend 4WD Tag-Along Tours to anyone – and so does my wife! Thank you for sharing the most amazing 4WD experience with us yesterday. We had a ball! As we said to you the tour surpassed our expectations by a mile. 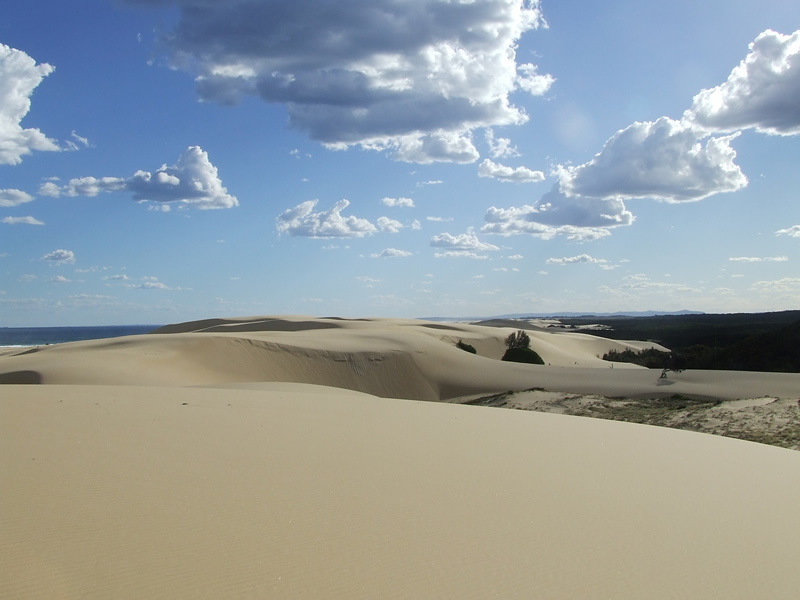 We thought that the tour included a trip along the beach down to Stockton and back, and were delighted when we found out that you were going to show us how to tackle the Dunes and have the opportunity to experience some of NSW most spectacular scenery. In particular, you provided us with insight into our 4WD capabilities and encouraged us to push our own driving capabilities in a safe manner. We have experienced tours all over the world, in particular early 2008, sand dune tours in Dubai, and by far your patience and focus on safety was of the highest standard and we should know because we have assessed safety and compliance of over 2500 tour operators across Australia. We will highly recommend your tour services to our friends and colleagues. I have attached some photos for your library should you wish to include any of these on your website. A huge, huge thank you for such an amazing afternoon. Your humour, patience and knowledge put us at ease while learning the capabilities of our X-Trail. We would never have attempted the “cliff face” sand dunes before spending hours as your “Lemmings”. We recommend your Tag-Along Tour to anyone wanting an exciting, fun, action packed, value for money afternoon that the entire family can enjoy together. This letter provides me the opportunity to recommend 4WD Tag-Along Tours, Bruce Boyle. Thanks for a wonderful day on Stockton sand dunes with your Business. Nissan took part in an incentive day for our salesmen on Stockton sand dunes. Our salesmen had experience in different vehicles from X-Trails through to Patrols on the sand dunes. 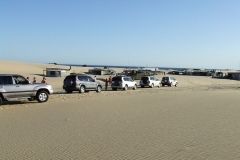 Some of our salesmen had no experience in the sand and by the end of the day they had acquired knowledge of the vehicles capabilities and four-wheel driving skills. We were impressed by how safety was of paramount importance, not only for the 4WD vehicles but also for the occupants. Bruce is knowledgeable and experienced in all aspect of four wheel driving off-road and education. Bruce is a professional outfit to work with and work well together as a team, and showed very good people skills. I have had many comments back from our salesmen that they were very pleased with the day with 4WD Tag-Along Tours. I have no hesitation in recommending Bruce and the Tag-Along 4WD Business. I look forward to doing business with them again. We did a Tag a Long tour a few weeks back and I told Bruce we were then heading up to Fraser Island. I just wanted to pass along our thanks to Bruce and give him a bit of an update. Fraser Island was fantastic…thanks to Bruce’s training and sound advice. We did over 400 km and never got bogged, although we did try. While others were sinking in the sand, we cruised right on by thanks to low tire pressure and not panicking! Good on ya Bruce. Everytime we came to a white-knuckle encounter and got through it no problem we gave a great cheer to Bruce’s teaching! What a great time. Bruce, Thank you for a wonderful day out with my daughter and her friend. Six years old can be a handful, but your tour ensured that there was not time for them to get up to mischief. Both the girls had a ball and I hope your hearing returns, after hearing their screams with excitement when driving down the dunes. Highly recommend to non-4W Driver’s as well, sit back in the passenger seat and let the expert do the work. The only draw back to the day, was piggy backing the girls up the dune after they sand bordered to the bottom. Great day was had by all, thank you again. We would like to drop a few words of appreciation for the great mentoring and guided tour you gave our family. Your knowledge is great but not only in 4WD also about the history of the places we drove through. Needless to say we were very impress to see the true love you have for the environment and the respect you have for the Indigenous people sacred places. 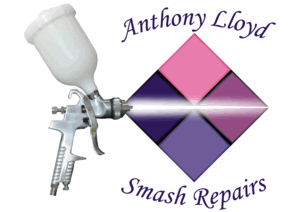 You have spoke very highly of the people with businesses in your area, which made us feel very comfortable with you. Your great sense of humour made was a great wall breaker, by the end of the trip we felt we were saying goodbye to an old friend. Thanks for being such a great support and helping out with the camera, we now have great photos as well. We now know how to use our 4WD – about time ha? Amazing trip for all of us that we will never forget. We will recommend you guys to anyone who ever want to know how to drive their 4WD and to those who haven’t they should still go with you and feel what it is like to go down such a high dune… something that many people think – it only happened in the movies! 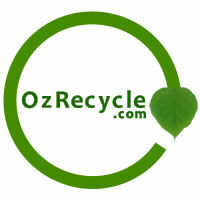 Thank you again, and we hope to meet you guys again in one of our trips there – you gave a good name to Port Stephens. We wish you the best of health and luck in everything. Cheers. Bruce is very knowledgeable, patient & entertaining. We all had a great day. Boys totally enjoyed sandboarding & going over & down the dunes. HIGHLY RECOMMEND. We plan to join them again. There might be a lot of sand dunes in the world, but there is only one Bruce. We enjoyed the ride and the beautiful afternoon and the sunset in late July 2008. Greetings from beautiful Germany, the Leister family. Perfect day and great extended service! We had a great afternoon with Bruce. There was never a time that we didn’t enjoy ourselves. They loved our “awards system” and he always kept us laughing. The skills we learnt from him has kept us out of trouble, most of the time. But months later when we went out by ourselves and got stuck in the sand, he remembered us and were more than glad to help us out. The customer service is second to none. If there is one thing you do in Port Stephens, this is it! Bruce made our holiday and our year! Thanks again for all your help. From all the P Award nominees!!! Just a short note to say thanks for a great afternoon last Saturday. We learn t a lot and had good fun doing it. We have travelled all over Australia since coming from England, this equals anything we have done or seen. WHAT GREAT FUN ! – A MUST DO WHEN IN PORT STEPHENS. ENTERTAINING,AMUSING AND VERY INTERESTING AND I DID MANAGE TO CONQUER THAT HUGE SANDHILL (STILL NOT SURE ABOUT THE 38.9 DEG – WILL BE BACK WITH A PROTRACTOR). THE KIDS LOVED IT ESPECIALLY THE SANDBOARDING. THANK YOU BRUCE – A VERY PLEASANT AFTERNOON AND WHAT ABOUT THAT FABULOUS SUNSET!! FUN does not describe the time we had in the sand! Fun for the whole family and to get educated along the way was the best thing we did on our recent holiday. Bruce was fantastically friendly, professional and kept us entertained as well as teaching us how to drive in the sand. We have been telling everyone we know and plan to return ourselves. thanks for a great time. Hi Bruce, We had the most awesome time last weekend with you on the 4WD Tag-Along-Tour. Definitely an experience to repeat. Our 16 month old daughter too surprisingly enjoyed the trip and the sandboarding and playing on top of the sandunes.. Your tips on 4WDriving and your know-how of the area was really helpful and fascinating. We recommend this tour to the adventurous at heart and most certainly will be going back ourselves. A unique and beautiful tour of nature at its best. It was a great day my favorite part was the sandboarding. Best holiday ever because of the tour. Bruce made our day, without him the tour wouldn’t have been the same. What I thought would be scary was great fun. We went with tag-along Easter this year and had so much fun and learnt heaps also we are coming back in June. I have done 4WD training elsewhere and I learnt twice as much with Bruce at half the cost . My family and I had a great day with lots of Laughs and heaps of Fun, PS loved the sandboarding. Thanks again we will be seeing you soon. What a fantastic experience to have had on our holiday to Port Stephens. Bruce, you made the day interesting, funny and lots of fun for the kids. I have 3 kids 7, 5 and 18months old and nothing was too much hassle. You even spent time with them, what more could you ask for. Can’t wait until we can do it again and we do recommend this day to anyone looking for an adventure. See ya all real soon Bye. Thanks for the best experience ever. We had such a fantastic time that we can’t wait to go back and experience it all again. It was definitely the best part of our holiday and have recommended the Tag-Along 4WD Tour to all our friends. Thanks Bruce, you were great and so full of laughs. See you guys again soon. P.S. My son, Stevan can’t stop taking about the bones!! Just thought I would thank you for an excellent afternoon on the dunes. Sarah and I had a wonderful time and have not stopped talking about some of the things that we learned about history, nature and driving off road. We will definitely recommend it to our friends. Excellent! A family tour and we all enjoyed it Bruce was great and it was well worth the money. Great fun, great people, we will definitely do it again!! Thanks for the tour, we all enjoyed it. One of my daughters and her friend didn’t want to leave. Bruce was really funny. Thanks for making it a really fun day for every one. I had a ball!!! 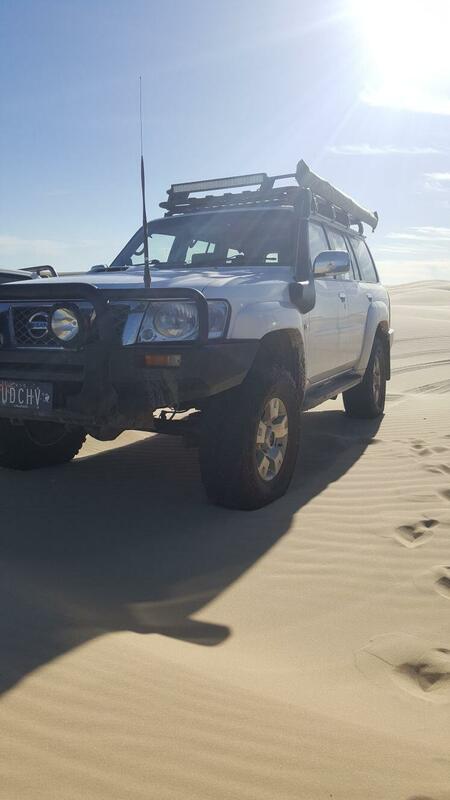 I have a 21 year old Toyota Bunderra with no power steering and have never 4WD’d before but Bruce got me driving up the dunes, down the dunes and digging myself out of the dunes! He pushed me out of my comfort zone but always made me feel I was in safe hands. Bruce has an excellent teaching manner, knows an awful lot about the beautiful Stockton Beach area, and has many great stories to tell. I would recommend Tag-Along Tours to anybody who enjoys driving and the Great Outdoors! Best part of our holiday. We just had the best day ever – so much so we did it again 2 days later. Thank you we now have the confidence to climb any mountain and or dune and laugh… Great fun, safe day out for families. The best day ever.